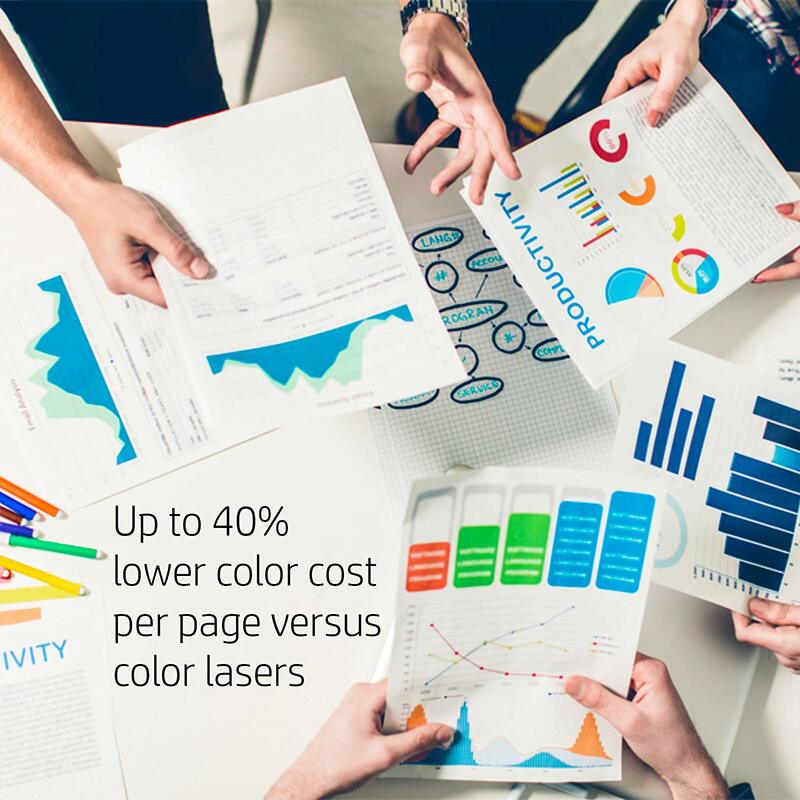 - Print speed professional mode: Up to 40 ppm black and color. - Print speed general office mode: Up to 55 ppm black and color. - First page out black: As fast as 6.5 sec. - First page out color: As fast as 7 sec. - Recommended monthly page volume: 750 to 4500 pages. - Paper handling input, standard: 500-sheet input tray, 50-sheet multi-purpose tray. - Paper handling output, standard: 300-sheet face-down output bin. - Warranty: One-year limited hardware warranty; 24-hour, 7 days a week Web support. HP PageWide Pro 452dw Printer Colored Inkjet Printer Main functions of this office printer: fast color printing, auto 2-sided printing, wireless printing, AirPrint, remote printer management, and more with 2 inches graphic display Drive productivity with the fastest printer in its class - first page out in 6.5 seconds & print up to 55 pages/minute Paper sizes supported: Letter, oficio, legal, statement, executive, 3x5 in, 4x6 in, 5x7 in, 5x8 in, envelopes (No. 10, Monarch) Use Original HP 972 ink cartridge for great results print after print. Print up to 2.5x more pages with optional high-yield cartridges One-year, on-site warranty, service and support; one-year technical phone support, chat, and e-mail - Wireless printing: Print and share with notebooks or PCs on an existing wireless network, using the freedom of built-in wireless. - Ethernet: Connect printing devices to PCs securely with built-in Ethernet ports. - Wi-Fi Direct: Send print jobs quickly and efficiently—wirelessly without a network. - AirPrint: Print from your Apple iPad, iPhone and iPod touch to your HP printer. - Easy mobile printing: Print straight from your smartphone or tablet in just a few simple steps. - 500-sheet paper tray: Save time and load less often with a high-capacity paper tray. 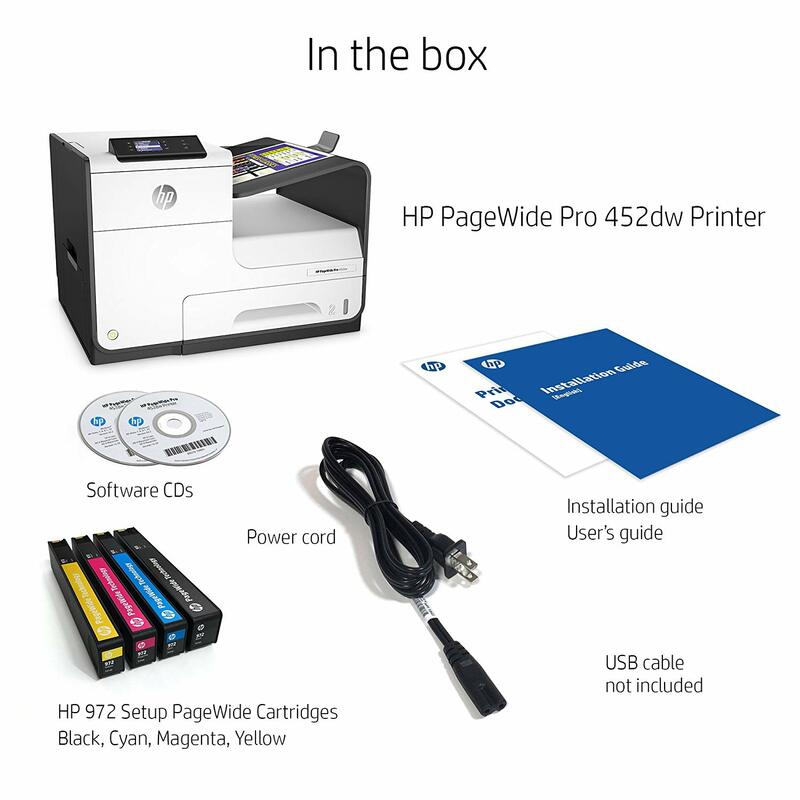 - HP PageWide Technology: Print across any tmp-width in a single pass. - Automatic two-sided printing: Save paper and time using fast automatic two-sided printing. - Business apps: Access the latest business tips, news and more with free apps—delivered on your schedule. - Remote printer management: Proactively manage your printer and remotely monitor status with HP Web Jetadmin. 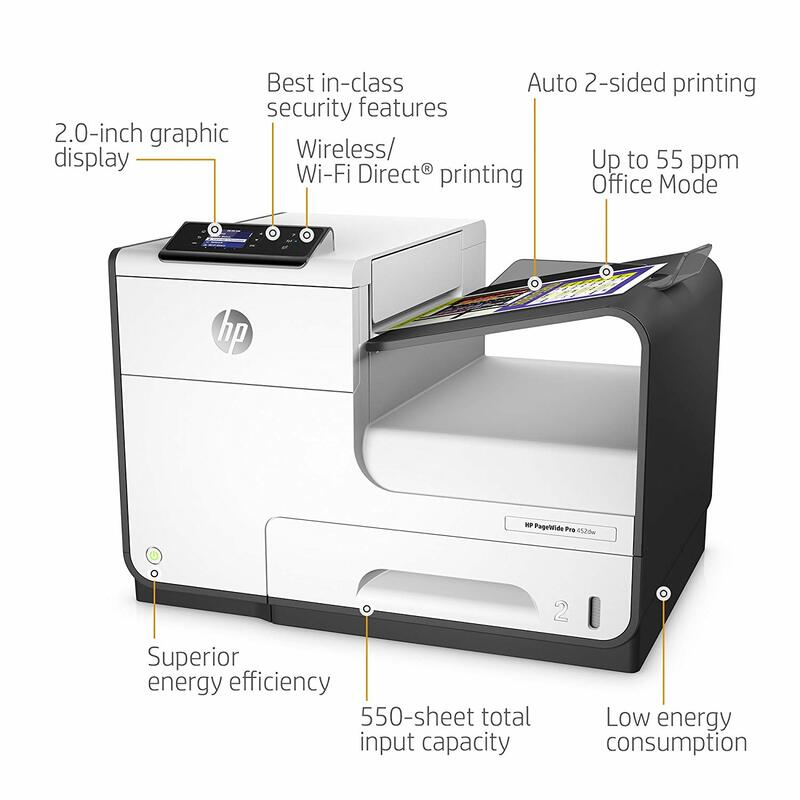 - ENERGY STAR: Save energy with this ENERGY STAR printer.